Kilt Hire at Gretna Green Famous Blacksmiths Shop - Wedding & Formal! It is not only the bride who can dress up in something special. The men in the wedding party can add a dash of Scottish flair to their day by wearing the Full Highland Dress... Call us on 01461 338224 for more info. NB the image below shows the Prestige package. Are you looking to hire a kilt for your wedding? Well at Gretna Green we offer a complete Highland Kilt Package for you to choose from. Shirt and tie can be added to the package for only $23.30. 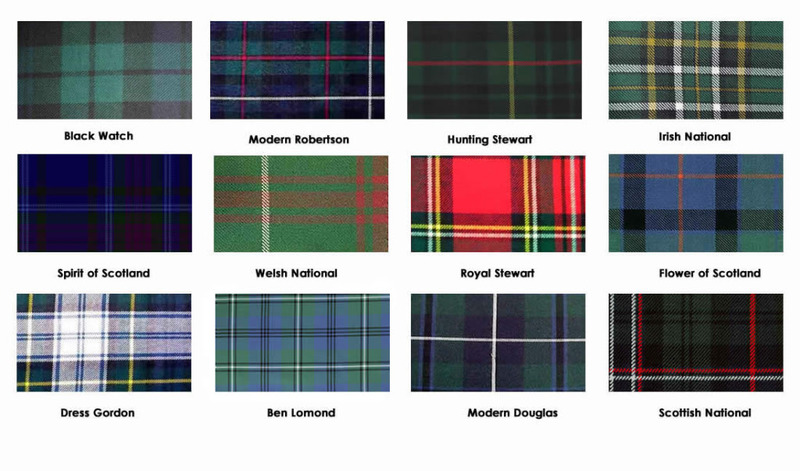 Scotland's National, Irish National, Welsh National, Spirit Of Scotland, Flower Of Scotland, Ben Lomond, Royal Stewart, Hunting Stewart, Black Watch, Modern Douglas, Modern Robertson, Dress Gordon. Please note the tartan swatches are for online illustration purposes only and some colours may vary slightly. Not sure what size to order? If you need information on how to measure for your kilt hire please download our Kilt Hire Measurement form. The above tartans are available for viewing - please see our tartan range for an illustration of how your tartan will look. Please note this is for online illustration purposes only and some colours may vary slightly. If you need information on how to measure for your kilt hire please download our Kilt Hire Measurement form. Would you like our help in helping you choose your kilt? Well here at Gretna Green we pride ourselves in providing a personal service to all our kilt hire customers. Let us fit you out from head to toe, hassle free! Why not give us a call on 01461 338224 for advice, we are here to help, or you may prefer to fill in the contact us form with your details and we will ring or email you. How far in advance should I book my kilt hire? It is generally advisable to book 2 - 3 months in advance for that special day but kilt hire can be provided at much shorter notice. Wondering if a deposit is required? Kilt hire requires a $32.40 deposit to be paid at the time of booking to secure the order and kilt outfits are ready for collection the day before your function and must be returned the following day. Would you like to purchase a kilt? We do not operate a mail order service for kilt hire outfits, they have to be collected from and returned to our Whisky and Gifts shop, beside the Famous Blacksmiths Shop. Anyone wishing to hire a kilt outfit is required to bring with them proof of their address and photo ID. This will usually be in the form of a driving licence or passport combined with a utility bill.